We celebrated our soon to be daughter-in-law Brianna’s birthday on Sunday this weekend. The month of October is filled with birthdays for my family. I think half our relatives were born in the month of October. Really there aren’t too many days in the month of October where I can say that either Mike or I don’t have a relative that has a birthday. It is actually kind of insane when I think about it. I know that it happens in large families like that sometimes, but wow. Well back to the birthday celebration. Brianna requested something with a stuffed chicken breast for her birthday dinner. I have made stuffed chicken breast with the spinach and the ham, so I wanted something a little different. I know that our family is big when it comes to pizza, so I decide to incorporate pizza into a stuffed chicken breast. Needless to say the chicken breasts were a hit, with the birthday girl along with everyone else that was here to celebrate Brianna’s birthday. I used pepperoni as part of the stuffing and wondered if the flavor would pair well with the chicken breast, but there was no need to worry the two paired quite nicely. The mozzarella to the Italian seasoning to the Italian bread crumbs all these ingredients made for a nice moist tasty chicken breast roll up. 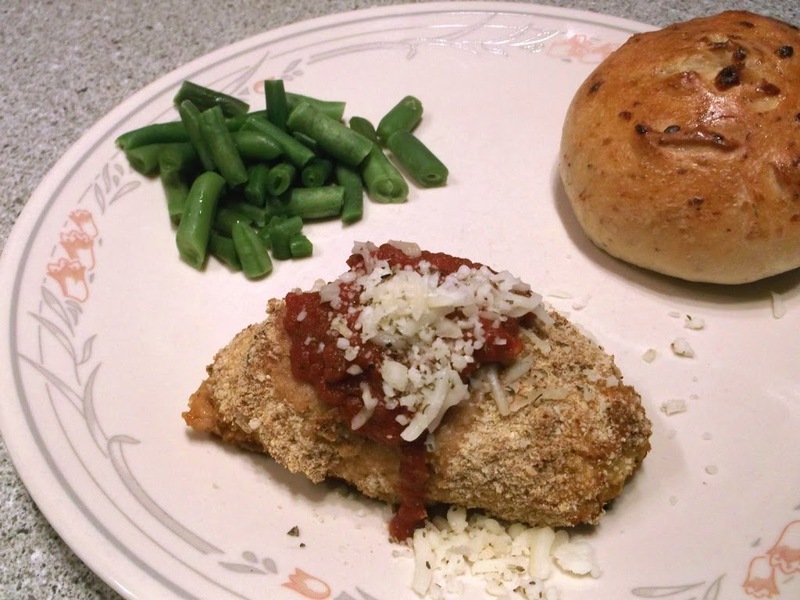 I served the chicken with Italian Cheese bread, which I will post the recipe on my next posting. 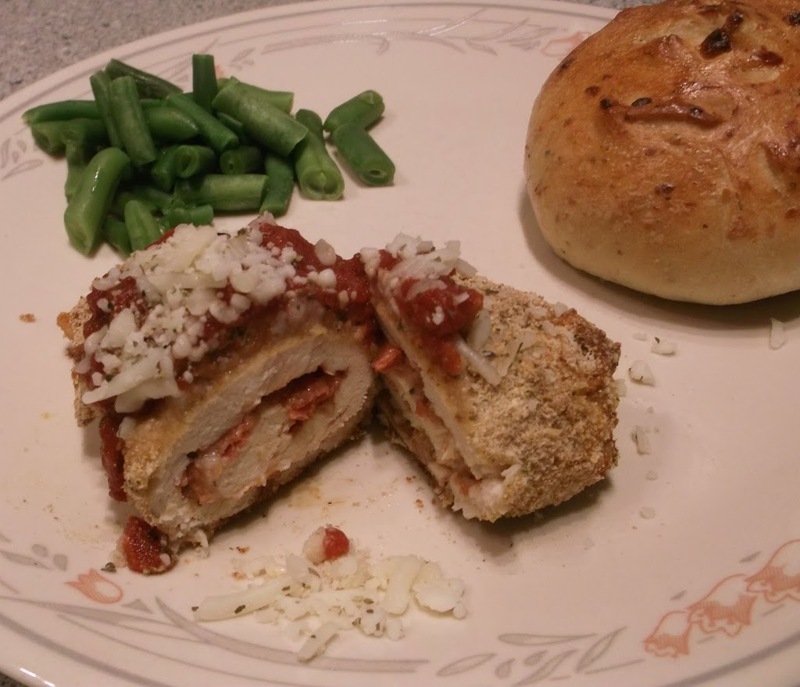 So if you like chicken and you like pizza I am sure you will like this chicken roll up. 1. Preheat oven to 375 degree F. Take a jelly roll pan or a baking sheet, line with aluminum foil and spray with your favorite non-stick cooking spray. 3. Pound each chicken breast thin. Sprinkle each chicken breast with salt and pepper, spoon on about a teaspoon of pizza sauce and spread out so the whole chicken breast is covered, sprinkle with your cheese and pepperoni mixture, and carefully roll up. You can place a toothpick in the chicken breast to hold it together while you finish the last steps. 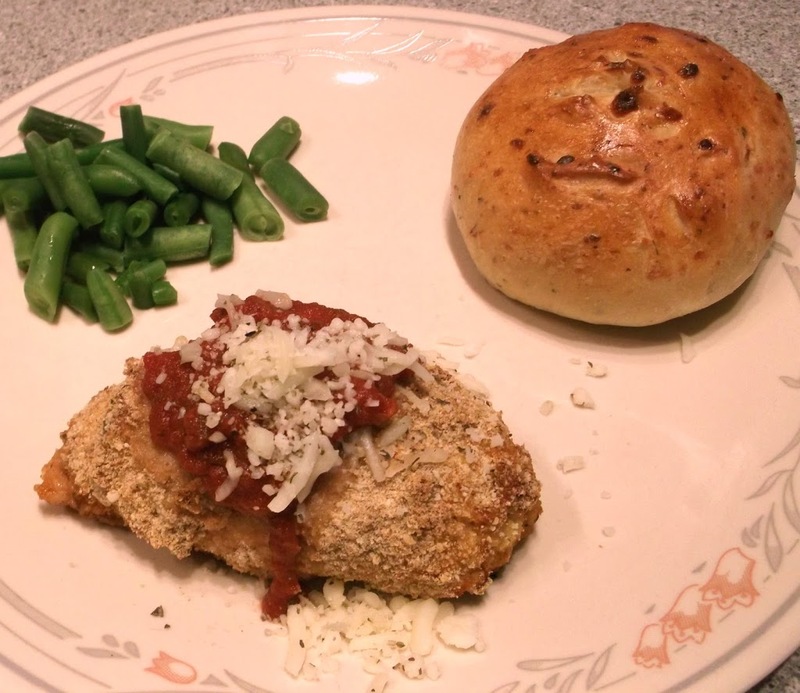 Placed the rolled chicken breast in the beaten eggs and moisten all sides from here place the chicken breast in the Italian bread crumbs and cover the breast generously. 4.Once all the steps are completed place the chicken breast seam down on your prepared baking pan, remove toothpick if you are using one. Place in the preheated oven and bake for about 30 to 35 minutes. Serve with pizza sauce that has been heated and some additional Mozzarella cheese. Enjoy. This chicken looks delicious and very tasty…like your creativity. What a great idea! These would be a big hit with my family.